Transportation costs students money and time, two objects students cannot afford. Bellevue College invites over 13,500 students to campus every quarter. Since the College is a “commuter campus,” the College lacks housing and students must enter and exit the College every day. The transit of students, staff, and faculty negatively impacts students. Between 2011 and 2013, travel delays increased on the I-90 corridor (71%) and the I-405 corridor (39%) (WSDOT). 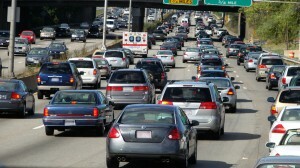 Students coming from Renton spend roughly 50 minutes in their car, one-way (WSDOT). For a 13 mile drive, their average speed is 4 miles per hour. That’s slightly faster than walking-pace! Students use college savings to commute. Each quarter students pay for gas, insurance, parking, depreciation, and maintenance. Excluding the cost of purchasing a car, the average cost of driving for 10,000 miles is $0.76 per mile (AAA). Therefore, the student driving from Tukwila pays $434.72 per quarter if they commuted to Bellevue College only twice per week. If the student gets an undergraduate loan, then those funds incur 4.29% interest (US EDU) annually – so it’s even more expensive! Parking at Bellevue College is expensive – between $40 and $65 per quarter. Bellevue grows by the day, and by 2040 the population will be 33% larger (Sound Transit). Despite growth, housing affordability drops. If a student works 19 hours per week at an hourly rate of $15 then they make $1,140 per month. That student can afford about $825 per month in rent (Zillow), but Bellevue’s average rent is about $1,860 per month (Rentjungle.com). By that math, Bellevue College students may not live in Bellevue. If students can’t afford to live in Bellevue, they commute from a cheaper location. Their home may be farther from school than they initially hoped. So what can be done? Fortunately, students can control their transportation costs. Traffic impacts on students drop dramatically when taking the bus. When more people ride transit, the traffic moves more swiftly. Not only do commute times decrease, but so do the financial impacts on students, since they don’t pay gas, maintenance, and depreciation. Bus passes go on sale in the Cashier’s Office (adjacent to the Bookstore in B building) one week before the quarter starts. Learn more about commuting to Bellevue College on the bus here. The impacts of financial and time costs decrease as students carpool to campus. Bellevue College offers reserved parking to students who carpool, and they can share the cost of one parking permit. Therefore, students who ride together, can save money and get to class on-time. Learn more about carpooling to Bellevue College here. City of Bellevue is an expensive place to live. Due to rent, the cost to live in Bellevue is high. As students are pushed out of the city, they spend scarce resources on travel – both time and money. Housing is difficult to find in Bellevue when on a budget. As demand increases (through population growth), the price increases as well – if supply does not grow with the population. Students have solved this problem by finding roommates, and the more people sharing a living space, the cheaper it becomes. However, City of Bellevue and neighborhoods are cautious of this issue. And capping the number of people living in a house is common. Students possess tremendous power in shaping affordability of housing. Getting involved in housing advocacy efforts, such as Bellevue’s ARCH or looking out for housing issues in the local paper, can open new doors for affordable housing. Students have alternatives to driving alone. They pay lot to travel, and they do not have to do so. Travel options and advocacy are two options, but there are many more. If the options in the second half of this article don’t work, then they can consider biking, walking, or taking online classes.